Ubuntu 11.04 Natty Narwhal is out in the wild! Check it out! Ubuntu 11.04 Natty Narwhal has just been released. Over at Ubuntugeek.com, they have a couple of great tutorials on the new features, and how to do an upgrade from 10.10 to 11.04. Here are a couple of short snippets. Go check it out! 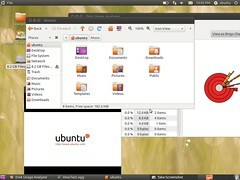 via How to upgrade from ubuntu 10.10 (Maverick) to ubuntu 11.04 (Natty) | Ubuntu Geek. For PC users, Ubuntu 11.04 supports laptops, desktops and netbooks with a unified look and feel based on a new desktop shell called “Unity”. This version supersedes Ubuntu Netbook Edition for all PC netbooks. The Ubuntu One control panel now allows selective syncing, and the launcher icon now displays sync progress. File syncing speed has been improved as well. The Ubuntu Software Center now allows users to “rate & review” installed applications, share reviews via integration with social networking services added into Gwibber, and has other usability improvements. via What is new in Ubuntu 11.04 (Natty Narwhal) Desktop | Ubuntu Geek. I run PinguyOS based on 10.10, so an update should be coming shortly…I will let you know when it does.